Although touchscreen laptops have been around for many years, they have only recently became popular again and more widely available from different brands due to the introduction of smart phone and tablets. You can even purchase a laptop that allows the screen to be flipped over or removed to be used like a tablet. However as these laptops have become more available to the general public and even favored by those who want to have a 2-in-1 laptop (also known as hybrids), there has been an increase in demand for a replacement screen due to accidental damage. Unfortunately these replacements can make it difficult to understand what is damaged, what needs to be replaced and how to repair. To start it is best to determine the type of touchscreen your laptop is. There are currently 2 types of touchscreen laptops. Ones that use a standard LCD to display an image and a separate front digitizer glass to respond to your touch and the other type have the touch embedded into the LCD during its manufacturing. Laptop models like the Lenovo Yoga 710, or the HP Spectre 360 can flip the screen all the way to the back to allow the laptop to be used like a tablet. These laptop models will have a standard LCD and have a separate digitizer glass to respond to your touch. This keeps it familiar to those who use smart phones or tablets that have display with a very thin bezel. Therefore if your laptop is a touchscreen that has glass that goes to the very edge of the screen, you have this type. Laptop models like the HP 15Z or Dell E6520 allow customer to custom choose if they want their laptop to have a touchscreen or not, as these models use the embedded touchscreen. Since the physical fit of the screens are the same, the design of laptop can remain the same as well. These laptops will have a thick surrounding bezel, usually about an inch thick, bordering around your screen. Our listings should also indicate the type you have even if you are unsure, we would not list a screen your laptop did not come with. Therefore if you pull up a laptop model on our site and it states it has embedded touch and you see no other option to suggest otherwise, you should be safe. As well removing the screen and using the screen model number will indicate if it has embedded touch or not. How to determine what part of the screen needs to be replaced, and understanding the different types available. Having a laptop with a broken screen is no fun, and having a touchscreen laptop does not make it any easier. It is important you understand what it is you need to order and that you are ordering the correct type so you can complete your repair without having to worry about any exchanges. We can start off with touch embedded screens, as these are the easiest replacement types to deal with. If you damage the screen, or it stops working, it needs to be replaced. Replacing an LCD with embedded touch is no different than replacing a standard LCD. Once you have located the screws that hold your bezel together and are able to remove it to gain access to your screen you have just complete the most difficult part of the job. At this point you can remove your screen and install the replacement and close everything back up. Simple. Done. However if you have a laptop that does not have an embedded touchscreen, you need to be prepared, and you may want to sit down for this one. To start we have to be clear on this. 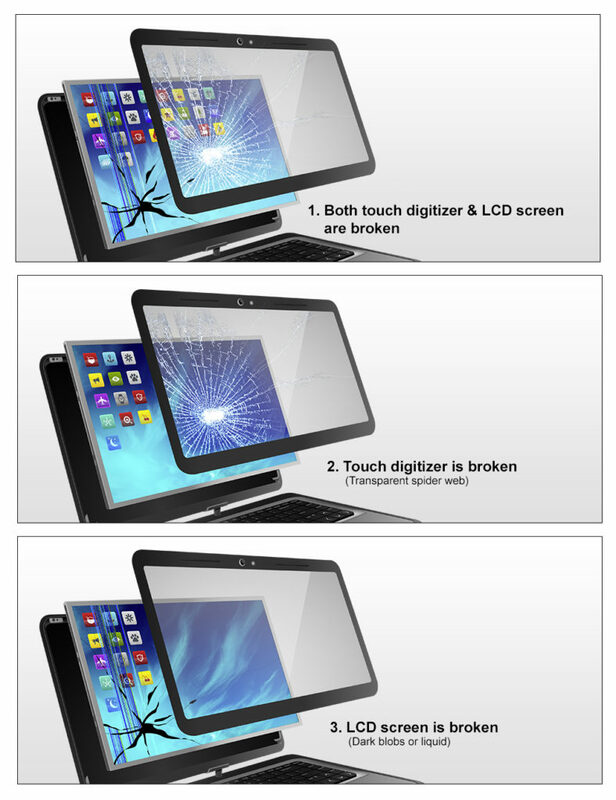 If your laptop is a touchscreen with glass that goes to the very edges of the screen like a smart phone or tablet, you are likely in possession of a laptop that uses a standard LCD to display the image which has a separate component called a glass digitizer “touchscreen” and is usually glued to the surface of the LCD. If you are only needing to replace the LCD because the front glass is not damaged, we recommend you remove your broken LCD first from the glass before ordering. The reason for this is you may end up accidentally damage the glass or you may find doing the repair to be to difficult and its best to have that figured out beforehand. If you only have damaged front glass the same rule applies, however the are additional reasons why. Some laptop models use 2 or even 3 types of touch glass replacements, and these are not interchangeable. Laptop models such as the Asus TP500L series or HP X360 use 2 types of digitizers that look identical from the front. You have to remove the touchscreen from the LCD and the bezel until you have just the bare glass in your hand so you can look and identify the connection type. In some cases the difference between type 1 and type 2 are indistinguishable unless you look very closely. Some examples can be different colourings, different product codes, or even slight physical difference in cable design. We post on the website the difference between the 2 types and what to look for to help you confirm what you need to order. We post warnings as well if there are more than one type and which type it is. If you are unsure of which type you have it is best you contact us directly and we will gladly assist. Typically there is a third component involved with these replacement, which is a bezel or skeleton from that the LCD and digitizer are glued into, to hold everything in place. If this portion is also damage we do not sell it separately, unless you see a listing that states the bezel is included, or it is listed as an assembly (Assemblies will include LCD, Digizer and bezel) and are the easiest type to replace for these styles of laptops. Can I replace my touchscreen to use a regular LCD instead? Or vice versa? The quick answer to this is no, and the reason being is that you are getting into complicated territory. This is not to say it can’t be done but we’ll try to explain the problems with this question. If you laptop has embedded touch and you would rather just have a regular LCD instead, you may be able to replace it. However we do not recommend you purchase a standard LCD for your laptop until you have contacted your laptop manufacturer first or look for online forums of someone who has done this before. The connector between the 2 types could be different on a technical level and you may need to replace your flat ribbon cable at minimum to be able to use it. If you laptop has the separate digitizer glass that responds to touch, than you already have a regular LCD, and you can’t really make this laptop to be a non touchscreen as the front glass is what holds everything together. I have an HP Envy M/N 13-d061na (non touch screen). Can it be replaced with an embedded touch screen? When buying it a year ago, I thought I didn’t need a touch laptop, though I think HP Envy touch laptops were available. I shall appreciate you response. Thank you.